Finally the day has arrived for our Intended Parents to bring their long awaited bundle of joy home!! (IP's, by the way, are no longer 'Intended'...they ARE parents) Whether the baby/babies are brought home directly from the hospital or after a stay in the NIC Unit or even through adoption, it is a major event often dreamed of. Below are a few links that will help prepare the new parents before this big day arrives! Although I am a parent and remember the happy times when I brought my own children home from the hospital, I also remember the surrogate babies that I left behind to start their lives with their own loving families. Watching new parents prepare for their babies to come home is so rewarding and I believe it helps everyone, when the time comes, to finally seperate and go their own way. As children grow and their bodies change, it's not always easy for parents to tell if a child falls within a healthy weight range. Body mass index, or BMI for short, is a standard measurement of body fat. Your child's BMI can help you determine if he is at risk for health problems based on his weight. Measuring the waist or neck circumference is another way to measure body fat in kids. Your health care provider may also do this. The CDC and the American Academy of Pediatrics recommend BMI screenings for all kids age 2 and older. Here's what you need to know about checking on your child's BMI and what to do with the info once you have it. What is BMI for Kids? BMI estimates how much body fat you have. Calculating a child's BMI number starts out just like calculating an adult's BMI. It's based on height and weight. But for kids, height and weight alone aren't as accurate as they are for adults. Why? Because kids' body fat percentages change as they grow. Kids' BMIs vary based on their age and gender. That's why when health care professionals talk about a child's BMI, you won't usually hear a plain BMI number, like 25, but rather a BMI percentile, like 75th. These BMI percentiles show how a child's BMI compares to other children of the same age and gender. To calculate the BMI percentile -- which is also called "BMI for age" -- a health care provider or an online tool like WebMD’s FIT Kids BMI Calculator takes a kid's BMI (along with age and gender) and looks it up on a pediatric growth curve. This gives the child's BMI percentile. So, for example, a 6-year-old boy with a 75th percentile BMI has a higher BMI than 75 out of 100 6-year-old boys. And though you may think that means he is heavy, he is considered a healthy weight. Many parents assume that if their child had a high BMI, their pediatrician would tell them. But that's not necessarily the case. Sometimes pediatricians may not bring up weight issues with parents. So if you're interested in your child's BMI percentile, it's best to ask directly. Some school districts have started to measure all children's BMIs in school. The school then sends home a BMI report card to alert parents to any weight issues. Although some parents don't like the idea of schools sending report cards with their child's BMI, experts say that the point is not to embarrass anyone. It's to let parents know about a health problem with serious consequences. Studies from the U.K. show that children's BMI report cards can work. One study found that after getting a BMI report, about 50% of the parents with overweight children made some healthy changes to their lifestyle. How Accurate is BMI for Kids? Experts generally consider BMI for kids to be a good measure of body fat, at least among heavier children. But there are some cases in which BMI might be misleading. Athletic kids, in particular, may fall into the overweight category when they are actually muscular. 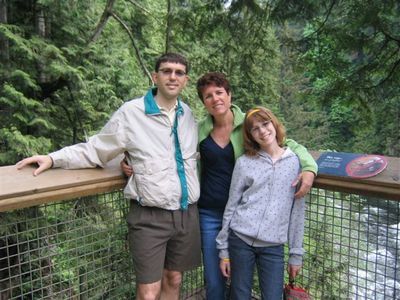 Your child's BMI is important, but it is only a piece of the picture. If a BMI percentile indicates that your child is not within the healthy range, she needs a complete weight and lifestyle evaluation with a pediatrician. The pediatrician will likely follow up with an exam to see how far along your child is in her development and perhaps tests for weight-related health conditions, and by asking questions about her diet and exercise, whether weight is an issue for her, and your family history. This information will allow the health care provider to determine the best way to respond to an underweight, overweight, or obese BMI percentile. Experts recommend that kids of all ages and all weight categories follow these healthy guidelines to help keep weight in check. It's easy to remember them as 5-2-1-0 every day. 5: Everyone in your family needs five servings of vegetables and fruits. Keep serving them even if kids don't eat them. Familiarity increases the likelihood that they'll eventually try a food. Give a fruit or vegetable with every snack or meal. 2: Limit TV-watching to no more than two hours a day. Family members who use other "screens" -- video games or computers, for instance -- get less TV time. Experts also recommend not having TVs in bedrooms. 1: Get one hour of physical activity. Add up the minutes each family member is moving -- it should be 60 minutes or more. Start small and keep adding if necessary. The goal is to have all those minutes be at least moderate activity, sweating after about 10 minutes. 0: That's how many sugar-sweetened beverages you should have a day. Juice drinks such as lemonade and fruit punch, sodas, tea, and coffee can all have added sugar. Stick to water and reduced-fat milk instead. Here are some other expert-recommended eating guidelines. Avoid eating fast food, and the temptations from eating out in general. Eat together as a family -- regularly. Check portion sizes, and serve your family accordingly. August is National Breastfeeding Month, which is fitting because breastfeeding is once again spiking in popularity among new moms as the preferred method of feeding their newborn babies. Breastfeeding is a personal choice that all mothers make and this trend is very healthy because breastfeeding provides so many benefits to both the mother and her baby. Chicago Healers Practitioner Dr. Marilyn Mitchell, MD, provides some of the benefits of breastfeeding. Nutrients and Enzymes- Babies who are breastfed take in nutrients and enzymes that are perfectly proportioned for a human infant. Bottled milk often comes from cows or soy and lacks the perfect blend of nutrients and enzymes that human milk provides. Supplemented Immune System- Breast milk also transmits antibodies from the mother to the infant, which are especially vital during the first few months of life when the infant’s immune system is immature and lacks the ability to produce its own antibodies. Healthier Life- Infants who breastfeed generally have fewer illnesses during the breastfeeding period than those who are bottle-fed and develop fewer allergies in their lifetime. Breastfed babies also tend to have less colic, fewer restless episodes, and better sleep patterns than bottle-fed infants. Helps Mom, Too- Breastfeeding increases metabolism, which helps with post-partum weight loss. It also helps with mother-child bonding due to the mutually pleasurable experience. When you have a baby, one of the things that should be on your “to do” list is getting a Social Security number for your baby. The easiest time to do this is when you give information for your child’s birth certificate. If you wait to apply for a number at a Social Security office, there may be delays while we verify your child’s birth certificate. So if you are about to have a baby, through Surrogacy, IVF, or without any help at all go to the hospital prepared with the information to start the Social Security wheels in motion! I read this study from Purdue University and found it interesting enough to post here...not necessarily because it involved children and the fact that we have an obesity issue in this country but because it poses another question; Does Location Affect Adult Weight? Now that's a study I would like to read about. I have to say that in the last 4 places I have resided in were located near a fast food and/or ice cream shop. Compared to the places we lived before, where no such temptations were close enough to walk, we now eat more ice cream out then ever before...It makes one think......I would like to add that we also live near several nice parks and a pound that is paved so it's easy to walk or bike around...and we do take advantage of those amenities as well...(we need to "walk off" the ice cream!) Do you find the same thing happening to you and your family? Living near a fast-food outlet doesn't make children fat, nor does living near a supermarket stocked with fresh fruits and vegetables make them thin, new research shows. The study by Indiana University-Purdue University Indianapolis researchers examined a decade of data on more than 60,000 children aged 3 to 18. They compared the children's weights before and after fast-food outlets or supermarkets opened near their homes. The study found that living near a fast-food outlet had little effect on weight gain and living near a supermarket wasn't associated with lower weight. The researchers also found that living near certain recreational facilities -- such as fitness areas, kickball diamonds and volleyball courts -- was associated with lower body-mass index (BMI). For example, an 8-year-old boy who lived near one of these facilities could reduce his weight by three to six pounds, the researchers calculated. But living near track and field facilities was linked to weight gain, they discovered. The findings were published by the National Bureau of Economic Research. "This study contradicts anecdotal information and provides scientifically verified insights into a wide range of variables that we hope will help physicians and public policy makers fight childhood obesity more effectively," study first author Robert Sandy, a professor of economics and assistant executive vice president of Indiana University, said in a school news release. He noted that previous studies looked at a single moment in time, not a decade of data. "Previous studies did not benefit from the wide range of information we acquired such as details of both sick- and well-doctor visits, changes in a child's address, annual food-service establishment inspection data, aerial photographs of neighborhoods and crime statistics over time. And other studies have not taken into account, as we did, families' self-selecting their locations -- for example, families who value exercise may be more likely to live near a park," Sandy said. When I read this Special Feature I knew that I needed to pass it along and the response back was tremendous. Really, this article drives home that its the simplicity in the telling of the facts that will make the answers easier to understand. In this Special Feature, Dr. Bergman discusses the mechanics of being a happy, healthy, gay family. I have to confess upfront that this is one of my favorite subjects. I study it. I counsel parents about it. Most importantly, I live it, together with my partner and our two amazing girls. What follows represents a summary of my opinion however, I urge you to contact me directly for more information. What you have to know at the outset is that your baby is going to be born to you not knowing anything about the world. Your baby won’t arrive with any opinions about how things are supposed to be. They arrive ready to be guided by you as to what’s right and what wrong. They don’t show up questioning what’s missing. Gay parenting, and surrogacy is not about something missing. It’s not about something’s wrong. It’s not about saying, “We couldn’t do something this way so we had to do it this other way.” It’s not about loss as perhaps adoption can be. There’s no loss. No one has given anything up. It’s about creation. As far as your child knows, you and your family are complete. Everything that your baby gets about your family, is going to come from you. Eventually the world around you seeps in, but mostly, it’s up to you to help them make sense of their lives. For this reason, I believe it is profoundly important that you get comfortable with who you are when you have kids. Your level of comfort or unease translates to your child. You set the level. The story that you tell your children is going to be their truth – nothing else. You can invent that story anyway you want. Daddy and Papa fell in love and got married and lived together and loved each other. We had so much love that we really wanted to have children to share it with. Daddy and Papa had the sperm, but we needed an egg and a uterus. So, a very nice woman gave us her egg and the doctor mixed it with our sperm. Then the doctor put that inside the uterus of another nice woman who very kindly allowed you to grow there for nine months. When you were born, you came out of her uterus and into our arms. We took you home and you were our baby. Simple, clear and truthful works best. I say: the day your child is born. You start telling the story even before the child can understand it and there is never a question about what happened. You tell the story in developmentally appropriate terms – so maybe you are not going to say sperm and egg and uterus to a two year-old or four year- old. The thing to remember is to tell the truth that’s developmentally appropriate. Me. This is my area of expertise. This is my passion. Surrogacy is a story of people who want to be parents. It’s the story of someone who needed help assembling all the ingredients. It’s a story of collaboration, love and intention. It’s a beautiful story. If we are not intentional with our response and comfortable with who we are, that’s when we have a tendency to inflate the importance of these questions. We end up adding negative meanings because we are scared we’re doing something wrong, but we’re not. I know from experience that when your child asks, “How come I don’t have a mommy?” you can easily and truthfully answer, “Because you have two daddies.” It really can be that simple. What do you need to be a healthy gay family? There’s no need to get defensive or scared. Your family is whole and vibrant. You are not coming from a place of scarcity. You will probably need one other thing. The willingness to take a stand for your family everywhere you are. What does taking a stand mean? It means, you, saying in front of that whole entire line of people, “He doesn’t have a mommy. He has two daddies.” That’s what it takes, everyday, everywhere you go. My partner and I take this approach. What we end up with is my kids correcting people all the time. You say in public to one of my kids, “Oh, you have such pretty, green eyes. Your daddy must have green eyes.” They will say, “I don’t have a dad, I have a sperm donor.” They are as matter of fact as can be. My kids have been saying that since they were three years old. I don’t mean you have to be on a soapbox. I just believe that you must tell the truth and not allow lies. So, don’t pretend like you didn’t hear it. Make the correction. Being a gay family doesn’t mean you are “political,” that may not be your intention. In truth, however, it turns out to be political sometimes. No. I’m not worried about it at all. The research that’s been done (which isn’t very much) consistently shows that the children of gay and lesbian parents are just as well-adjusted as everyone else and more flexible. Gender identity seems to be internal. You have heard the classic example, right? Most gays and lesbians were born and raised by straight parents. But still, won’t your teenager be ashamed to have gay parents? Don’t panic though. Teenagers are ashamed about everything having to do with their parents. Adolescence is about individuating, differentiating and independence. The way that children work through this stage is by pushing against the thing they’ve been so close and connected to. That’s you, their parent. It really doesn’t matter. Being a gay parent is just as much a pretext as anything else that’s going to embarrass them. Whatever it is - You’re too strict. You’re too liberal. You dress badly. I even have kids in my practice who are embarrassed because their parents work out and are in great shape. They will find something. The upside is that being the gay parent of teenager is not going to be worse. The downside is that it’s probably not going to be better. You develop a foundation of trust and respect. You instill these values in your child from the day you get them in the hospital. You repeat that they are the most wanted child in the world. You tell them the story of all the planning, the collaboration, the intention and the love that went into their creation. 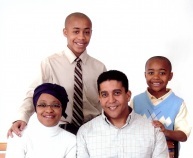 Your child will realize, there may be something different about your family, but there’s nothing inferior or wrong. They’ll come out the other side of adolescence and love you again. Keep your checkbook handy. Infertility Answers Online; A new support forum just for you! I hope that you had a wonderful holiday! And now it's time to start all over again in 2009....or continue what was started in 2008! Over the weekend I decided to add a simple message board on Infertility Answers called Infertility Answers Online (IAO). It has two simplistic categories; Surrogacy and Egg Donation. If you are an Intended Parent, Surrogate, or Egg Donor, please check this out! If you need support, have a question or concern then I am hoping that this forum will be an asset as you use Third Party Family Formation to build a family. http://infertilityanswers.net/infertility_answers_online Your feedback is always welcome! This is so funny and TRUE...It sure does remind me of MY mother at times! Enjoy and happy Sunday! I am off to Florida! WASHINGTON (AP) -- It's one of the biggest frustrations of life with food allergies: That hodgepodge of warnings that a food might accidentally contain the wrong ingredient. The warnings are voluntary -- meaning there's no way to know if foods that don't bear them really should. And they're vague: Is "may contain traces of peanuts" more reliable than "made in the same factory as peanuts?" Now health officials in the U.S. and Canada are debating setting standards, amid increasing concern that consumers are so confused they're starting to ignore the warnings. "Really, the safest thing you can do is make all your food at home from scratch, period," says Margaret Sova McCabe of Sanbornton, N.H., whose son Tommie, almost 8, is allergic to peanuts, dairy, wheat and five other ingredients. But she doesn't find that practical -- and repeatedly has spotted longtime favorite "safe" foods suddenly bearing new warnings that accidental contamination is possible after all. "Sometimes we buy the product anyway, and sometimes we don't," says McCabe, who is a law professor and questions how often the warnings signal liability protection rather than true risk. "What does this really mean? Can I count on it, as a consumer, to really have any meaning?" she asks. The Food and Drug Administration will ask those same questions at a public hearing on Sept. 16, a first step toward developing what it calls "a long-term strategy" to clear the confusion. "Advisory labeling may not be protecting the health of allergic consumers," the FDA acknowledged. Canadian authorities have gone a step further, saying accidental-allergy warnings are "misleading consumers" and advising food makers to begin clarifying them even as Health Canada researches a formal policy. The food industry recognizes there's confusion. The Grocery Manufacturers of America has been working to set new guidelines on the warnings for more than a year, but declined comment before next month's meeting. About 12 million Americans have food allergies. Severe ones trigger 30,000 annual emergency-room visits, and 150 to 200 deaths a year. Starting in 2006, a U.S. law required that foods disclose in plain language when they intentionally contain highly allergenic ingredients such as peanuts or dairy. Left out of the law are accidental-allergy warnings -- for foods that might become contaminated because they were made in the same factory, or on the same machines, as allergen-containing products. The FDA has said that a quarter of inspected food factories have the potential for such a mix-up. More and more foods bear precautionary labels, but there's a disconnect. The Food Allergy & Anaphylaxis Network, an influential consumer group, counts at least 30 different ways that the warnings are worded -- and consumers too often falsely assume that one food is riskier than another because its label sounds scarier. Three-quarters of parents of food-allergic children surveyed by the group in 2006 said they would never buy a food with an accidental-allergy warning, down from 85 percent in 2003, when such labels were novel. The FDA's own surveys found the allergic pay more attention to warnings that a food "may contain" an allergen than those "made in the same factory" labels. Yet when University of Nebraska researchers tested nearly 200 products with various accidental-peanut warnings, they found that peanuts were more likely to have sneaked into products labeled "made in the same facility." And Health Canada researchers recently discovered that some chocolate labeled as possibly containing "traces" of peanuts or tree nuts in fact contained up to six times the amount that the government considers a trace level. Contributing to consumer mistrust are puzzling warnings, like canned or frozen vegetables with nut precautions. Just last week, allergy network founder Anne Munoz-Furlong was stunned to receive a basket of fresh fruit with a warning that it might contain nuts or milk. "Right now everybody's making up their own rules," Munoz-Furlong says -- and she's pushing FDA for clear standards to help consumers understand which foods to avoid. In Canada, the government's review is just beginning, but meanwhile it recommends foods bear one of two labels: "May contain X allergen" or "Not suitable for consumption by persons with an allergy to X." Back in New Hampshire, the McCabes show how tricky label reading is. Tommie has loved a particular nondairy soy yogurt since infancy. When it began bearing an accidental-allergy precaution, his mother toured the factory and was relieved by how the equipment was cleaned. But last week, she noticed the label had changed again, to say the yogurt might also contain live cultures based on milk. It "maybe illustrates how difficult it can be when you have food allergies to stay on top of that information," McCabe said. Q: Why do I need to take prenatal vitamins or even folic acid before I even get pregnant? I thought that taking prenatal vitamins was for when YOU ARE pregnant! Folic acid, sometimes called folate, is a B vitamin (B9) found mostly in leafy green vegetables like kale and spinach, orange juice, and enriched grains. Repeated studies have shown that women who get 400 micrograms (0.4 milligrams) daily prior to conception and during early pregnancy reduce the risk that their baby will be born with a serious neural tube defect (a birth defect involving incomplete development of the brain and spinal cord) by up to 70%. The most common neural tube defects are spina bifida (an incomplete closure of the spinal cord and spinal column), anencephaly (severe underdevelopment of the brain), and encephalocele (when brain tissue protrudes out to the skin from an abnormal opening in the skull). All of these defects occur during the first 28 days of pregnancy - usually before a woman even knows she's pregnant. Doctors and scientists still aren't completely sure why folic acid has such a profound effect on the prevention of neural tube defects, but they do know that this vitamin is crucial in the development of DNA. As a result, folic acid plays a large role in cell growth and development, as well as tissue formation. Myth: The only acceptable home for a child contains a mother and father who are married to each other. Source: Golombok et al. 1983, Green, R., 1978, 1986. Excerpted from the Family Pride Coalition. Tags: 1978, 1986., Family Pride, Family Structure, Golombok et al. 1983, Green, R.
Las Vegas: A Family Vacation? YES! 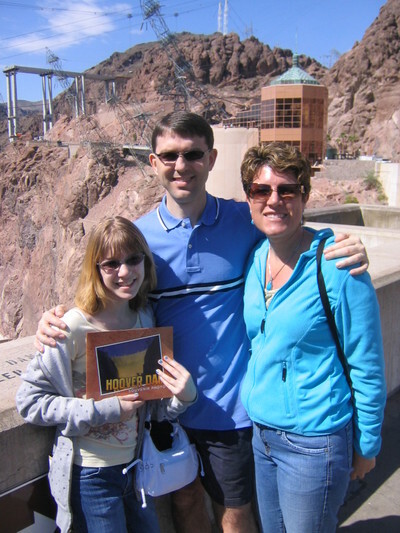 Because it's Sunday again I feel like I can share a bit about my recent trip to Las Vegas and the Hoover Dam with my husband of 23 years, Joe, and our 12 year old daughter, Erika. Bring a 12 year old to Vegas you ask?! YES! There is so much for families to do in Las Vegas that even Erika stated, on day 2, that there was more to see then Disney World and I have to agree. 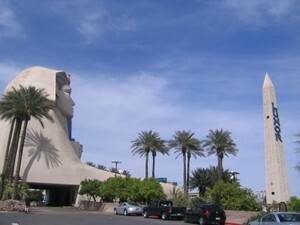 In a nutshell our 3 nights and 4 days went like this: We arrived Tuesday around noon and we bought round trip shuttle service at the airport to the Luxor Las Vegas - Luxor ...that way we didn't have to worry about the ride back on Friday. We made it to the Luxor and our spa suite was ready...on the 19th floor we had a great room with a whirlpool tub and a smaller room off the bed room that Erika promptly claimed. It had a fridge, TV, Sofa and a couple of tables. The entire room (and hotel) is Egypt themed which was right up Erika's alley. From there we walked to a couple of hotels and finally ate at one of Wolfgang Puck's places for lunch..in the MGM I think...then we went down to this 1/2 price tickets tonight place and bought some 4 PM magic show tickets for the Tropicana. Xtreme Magic Dirk Arthur Las Vegas The show was good...and we had great seats...it featured tigers and other big and rare cats so we all really liked that...we went back to the hotel where Joe and Erika spent some time at the pool...I rested (well it IS my vacation too!) ..and then bought some dinner for in the room at the food court. (Quiznos) Erika stayed in the room and watched TV while Joe and I played some slots...No I didn't win...but Joe entered into a couple of poker tournaments throughout our trip and came in 2nd in one and 1st in another so he was happy! Day 2 Wednesday morning I sent Joe and Erika down the strip to Denny's for breakfast while I waited in line to get tickets for Mamma Mia, Hoover Dam and the Titanic artifacts exhibit at the Tropicana. Its a long wait at times but you can get great deals at this 1/2 price tickets place. The doors open at 11 am but the line has already started to form outside. All the left over tickets go on sale for that same day. For example the Mamma Mia tickets were just $55 each when we would have had to pay $110 each...and we had great seats! Anyway...after I bought all the tickets I met up with J and E and we walked through some of the larger hotels together including the Bellagio where they have this beautiful conservatory Bellagio Conservatory and Botanical Garden - Las Vegas with spring flowers blooming and butterflies etc. It was really nice. (and did I mention, FREE) We went back to the hotel as it was mid-afternoon and we had reservations for dinner in the Mandalay Bay at 5:30 and then the Mamma Mia show at 7:30pm. We loved it! Mamma Mia Las Vegas We had a call from our neighbors while in the show who happened to be in town for a wedding and so we made plans to talk to them when we returned from the Hoover Dam VIP Tour on the next day. We put Erika to bed and Joe played some poker and I did poorly on the slots but made my money last....still its fun with all the glitz and glamour! That's the trip! !...I am sure I left out some things...the weather was GREAT the entire time we were there...the smoking was pretty heavy...one of the things I hate about casinos...and Erika was miffed that she couldn't "push a button" or watch people playing slots because she was under 21. If you are thinking of a family vacation a few days in Vegas maybe your best bet...I don't recommend it for the very young...maybe 8 and up for some of the cool shows...Blue Man Group is there and there are plenty of magic and variety shows...not to mention secret gardens and food galore! Listed below are some links to various umbilical cord blood sites and educational information. I personally didn't have this choice when my own children were born in 1986 and 1996 however, in 2000, my IP's decided to bank the cord blood of their newborn twins...and in 2005, my 2nd couple decided NOT to bank the blood of their newborns...so you can see, it is a very personal decision that needs to be made individually. I read on one of these sites that the odds are that the average baby will ever use his or her own banked cord blood is considered very low. The primary reason that parents consider banking their newborn's cord blood is because they have a child or close relative with a family medical history of diseases that can be treated with bone marrow transplants. On the other hand public cord blood banking is strongly supported. Its up to you to research the facts well before the birth. It's a procedure you have to choose and plan for beforehand as it is not routine in hospitals or home births. Not that I am sick of hearing myself 'talk' but having a 12 year old daughter I can certainly relate to this mom.....but do I think it will work? Only time will tell! [BioNews, London] A British woman has had some of her own eggs frozen for her ten-year old daughter to use in the future, as she will be rendered infertile by a genetic illness. As frozen eggs for donation can only be kept for 10 years, and the mother's eggs were frozen when the girl was only eight, her daughter will have to use the eggs before she reaches the age of 18. The girl has Turner syndrome, where one of the two X chromosomes carried by women is missing, and which almost always causes infertility, although women with the condition can conceive using donor eggs. The syndrome affects around 2,500 girls born each year. In 2005 her mother decided to freeze some eggs for her daughter, to give her the chance of having a baby genetically related to her. The case has caused some to call for a change in the law, as the girl is unlikely to be in a position to want to have children by 18, when the eggs will have to be either used or destroyed. The mother, who is campaigning for the law to be changed, said 'I don't want to put my daughter under pressure, and I don't think she should be having to make that choice at that age. We feel real sadness that, for no particularly justifiable reason, our daughter is going to be put in an impossible situation'. Proponents of a change in the law argue that the ten year rule is arbitrary, with Gillian Lockwood, medical director of Midland Fertility Services, arguing that it has 'no scientific justification at all'. The family's cause is being supported by their MP, Andrew Stunell, who has also raised the issue in the House of Commons. Mr Stunell is considering tabling an amendment to the Human Fertilisation and Embryology Bill, which is in the process of being debated in Parliament. He said, 'my constituent and her family are in a Catch-22. She faces a ten-year maximum storage period, by which time her daughter, who would be the beneficiary of the donation, would not be at an appropriate age or stage in her life'. The Department of Health has said that the storage rule could be changed without primary legislation, and is an issue that will be considered once the new Bill has been made law. Another solution would be for the girl to have the eggs fertilised with donated sperm, and to have those embryos frozen, which could then be stored for a further 10 years. So we left the Seattle area taking the northern route toward Vancouver, B.C. Driving on the I5 highway was a beautiful ride on a Sunday. The sun was shining and we were all in a great mood. Waiting the 45 minutes to cross the border into Canada wasn't even that bad with the windows rolled down and a light breeze wafting off the Pacific Ocean from the left and on the right, a lovely little speck of flowering shrubs and green grass where the Peace Arch Provincial Park is located. (No we didn't get out and stroll because we were hoping for a miracle to happen. One that included the lines moving faster through the check points into Canada....don't hold your breath!) We did bring our passports and once it was finally our turn it was all of 55 seconds of where are you going and why and THEN we were through and experiencing THE GREAT NORTH WEST of Canada....where road signs are hard to follow! Back at the hotel, we settle Erika in with some ice cream, the remote control and the cell phone while Joe and I decide to support our neighbors, the Canadian's, with some of our hard earned American Moola. This is my way of saying...NO we didn't hit the big one on the slots and don't ask anything about the exchange rates at the Casinos! But it was fun for a while and we tucked ourselves into our heavenly bed by midnight! Memorial Day dawned bright, I'm sure...but I didn't see a bit of light until 10:30 am. Now THAT's a Vacation! We packed up and by 11:30 we were out the door and on our way North through Vancouver to Capilano. 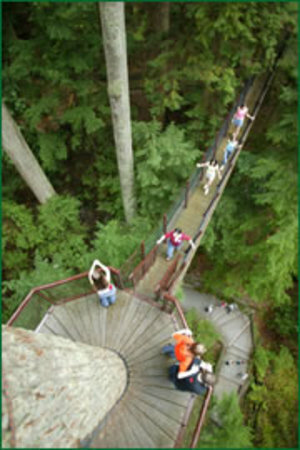 I highly recommend a visit to the Capilano Suspension Bridge | Explore the Park . It is beautiful! And well worth the price. 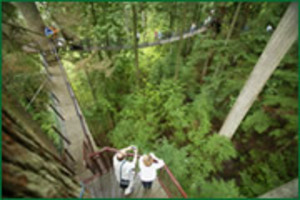 We had only thought that the Suspension bridge would be the best thing about it but we loved the bridges in the tree tops as well as the cliffhanger walk. This is perfect for all ages and I really don't think you need to worry about any small child falling through the cracks...there aren't any! It is perfectly safe.....although I saw MANY older people hanging on for dear life! We stayed a couple of hours and may have stayed longer if we didn't need to get back to Seattle. Again, on the drive back, we had to wait at least an hour to cross onto US soil and again, our passports came in handy. But this time there was no breeze as we took a less scenic route back to America and I5. We will be traveling north again but we may take a ferry to Victoria the next time. I always believe in taking full advantage of where you are living and see what is out your very own back door......and with travel starting to cost so much these short trips maybe all we do for a while! What better way to spend a Sunday then to get a babysitter and go out to a relaxing dinner with your partner before the busy week starts. Do you have a note book with all the information listed (below)? Once you have most of this information written out you only need to change where you will be each time you leave your child/children with a sitter. Any time it seems there has been a breach of security in the home, such as phone calls where no one answers, suspicious visitors, etc. The above may seem like an exhaustive list but once you have prepared it, it’s ready each time someone baby sits for you. It’s a small investment for the children’s safety and your peace of mind. So if you are about to have a baby, through Surrogacy, IVF, or without any help at all, go to the hospital prepared with the information to start the Social Security wheels in motion! LITTLE ROCK (May 9) - It's a Happy Mother's Day, indeed, for Michelle Duggar - she's pregnant with her 18th child, and says she has no plans to stop any time soon. Seven daughters and 10 sons just wasn't enough for Arkansas couple Michelle and Jim Bob Duggar. Just in time for Mother's Day, the busy parents announced they're expecting their 18th child. Their oldest, Josh, is 20, and youngest, Jennifer, is 9 months old. Here, the family celebrates Jennifer's birth last August. Duggar, 41, is due on New Year's Day, and the latest bundle of joy will join seven sisters and 10 brothers, including two sets of twins. "We've had three in January, three in December. Those two months are a busy time for us," she said, laughing. The Duggars' oldest child, Josh, is 20, and the youngest, Jennifer, is nine months old. The fast-growing family lives in Tontitown in northwest Arkansas in a massive 7,000-square-foot home. All the children - whose names start with the letter J - are home-schooled. Pregnancy is nothing new for Michelle Duggar - she's been pregnant for more than 11 years of her life, according to "fun facts," on the family's Discovery Health web page. The Duggars have been featured on several Discovery Health shows, and are in the process of filming another series. The new show looks at life inside the Duggar home, where chores - or "jurisdictions" - are assigned to each child. One episode of the new show involves a "jurisdiction swap," where the boys do chores traditionally assigned to the girls, and vice versa, Duggar said. "The girls swapped jurisdictions, changing tires, working in the garages, mowing the grass," she said. "The boys got to cook supper from start to finish, clean the bathrooms," among other chores. Duggar said she's six weeks along and the pregnancy is going well. She and her husband, Jim Bob Duggar, said they'll keep having children as long as God wills it. "The success in a family is first off, a love for God, and secondly, treating each other like you want to be treated," Jim Bob Duggar said. "Our goal is for each one of our children to be best friends, and everybody working together to serve each other makes that happen." The other Duggar children, in between Joshua and Jennifer, are Jana, 18; John-David, 18; Jill, 16; Jessa, 15; Jinger, 14; Joseph, 13; Josiah, 11; Joy-Anna, 10; Jeremiah, 9; Jedidiah, 9; Jason, 7; James, 6; Justin, 5; Jackson, 3; and Johannah, 2. I am one of those mom's who believe's in getting every vaccine known to man so that my child won't suffer....however, my daughter Erika, recently pointed out as she was getting her last HPV shot, that she is SUFFERING NOW! (she hates shots) But I worry that later in life she might catch something and because I failed to ignore her cries and not protect her through vaccinations that she will suffer even a worse fate. I subscribe to Dr. Sears news letter and below is a list of the 12 routine childhood vaccines and I thought that I would share them with you. important step in making an educated decision regarding your child’s vaccines. This bacteria causes meningitis, bloodstream infections, and pneumonia. It is still fairly common. Most cases are in infants or the elderly. It can be fatal. This bacteria causes severe coughing fits. Fatalities do occur, mainly in young infants. It is still a very common illness in the U.S. This virus causes severe diarrhea, vomiting, and dehydration in infants. It is extremely common and can be fatal. This virus causes fever and rash. It can damage internal organs but is rarely fatal. It is now fairly rare in the U.S., although a recent epidemic did sweep through the Midwest. This virus causes the classic “flu”. It is extremely common and causes come fatalities in infants and elderly. It's Sunday again! Funny how the weekend just sneaks up on us all like that! Today I would like to feature a piece from a blog on parenting. Marni Wells is the mother of 12 kids! Yes!! 12...and all single births too! She has a lot of great advise and I would like to post Positive Praise today because it is not just for kids, praise makes everyone feel good! Please visit Marni's website and enjoy! You can even sign up for her newsletter! Thank you for reading my blog! You are all greatly appriciated! It can cause increase in stature. It can bring renewal and a lighter step. It can lift a heavy load. It affects every life at every age. Do you want to change things in your marriage, your work, your children, your school, committee meetings, church, relationships??? Try praise. "You will win more bees with honey"
I AM SUGGESTING that you begin to practice praise. Start by making a decision to give 1 genuine praise per day per individual. This does not come natural in most cases. So you will need to be intentional to pull it off. You may meet some skepticism in the beginning but don't let it hinder you. Make it a practice. Children will thrive with praise. You do not need to worry that they will become proud or spoiled...if the praise is genuine it will do it's job. 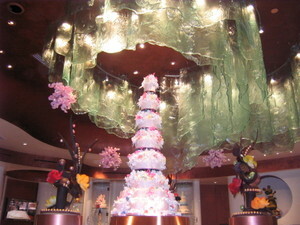 It can be delivered privately or in a group setting, in a note, letter, with a gift or alone. Don't let anything stop you. Praise. Praise PRAISE!! A friend sent me this site and it's really an eye opener. Because Beauty is a multi-billion dollar industry and targeted at our girls, I felt that it was more then appropriate to place this on my Sunday Parenting 101 blog. Intended Parents look at Egg Donors the same way in my opinion. The first thing they see is the physical form and only then will they look deeper into who she really is. This may be the wake up call! In 2004, Dove launched the Campaign for Real Beauty. It ditched the industry standards for advertising. There would be no more unrealistic beauty standards. Dove also launched a self-esteem campaign. It attempts to dispel beauty myths. Part of that campaign involves viral films. These two films show how the beauty industry distorts reality. It’s an important lesson. Pass this on to anyone with a teenage daughter. Below are some guidelines based on information from the American Academy of Pediatrics and from Bright Futures, which is funded by the U.S. Department of Health and Human Services. It's always a good idea to be prepared with your own list of questions and concerns for the Dr. Although there are many Dr. visits within the first year, remember babies change and grow rapidly which means that your questions will change as well. I hope this list helps you with your first newborn visit. Ask how things are going with your new baby. Make sure that your baby received antibiotic drops or ointment for the eyes and a vitamin K shot. Make sure that your baby has a newborn screening blood test. Recommend an immunization for your baby: Hepatitis B. Give you an opportunity to ask questions. Always use a car seat , backward-facing in the back seat until your baby is at least 12 months old and weighs 20 pounds. Always use your own seat belt. Place your baby on his back to sleep. Make sure your baby's crib is safe. Never leave your baby alone on changing tables, beds, sofas, chairs or other raised surfaces. Set thermostat on hot water heater to 120 degrees F or below. Install smoke detectors on every floor in your home and test them monthly. You cannot spoil a newborn. Try to comfort your baby when he cries, by holding, rocking or cuddling him. Rest whenever your baby is sleeping. Realize that you may feel tired, overwhelmed or depressed. Schedule an appointment for your baby's next visit, usually within one to two weeks after birth. MANHASSET, N.Y. (March 5) - When they get older, Logan, Eli and Collin Penn may blanch at the notion they wore nail polish to their first news conference. But it's the only way their parents know how to tell the boys apart right now. The identical triplets were born Wednesday at North Shore University Hospital on Long Island - an event so rare that an obstetrician estimated it might happen just once in 200 million births. Allison Penn looks at her identical triplets Tuesday at North Shore University Hospital in Manhasset, N.Y. From left are Logan, Eli and Collin. The triplets resulted from just one embryo implanted during in-vitro fertilization. The odds of giving birth to identical triplets are one in 200 million, an obstetrician estimated. The triplets' mother, Allison Penn, was impregnated with just one embryo through in-vitro fertilization, said Dr. Victor Klein, a specialist in multiple births and high-risk pregnancies who delivered the boys. That embryo split in half, and then one half of that split again, he said. "This is the first one we're aware of in the literature in the country in which they only put back one embryo" and a woman gave birth to triplets, said Klein. "Most people put back two or three embryos, and you just never know." Identical triplets are born at a rate between one in 60,000 and one in 200 million, depending on the research, Klein said. Allison Penn, 31, said she and her husband, Tom, 46, had tried to have a baby since they got married about four years ago. Although she once thought of having several children, the disappointments over four years revised her dreams downward. "When it took us so long to get pregnant, I just assumed we were going to have one, and that would probably be it," she said. "So I thought one would be good." And when she and her husband were told three youngsters were on the way? "I looked over at Allison and her mouth was wide open and her eyes were like saucers, and she didn't say a word," Tom Penn said. "Then I realized that it was possible, and then I started to laugh." He confessed he couldn't get over the irony. "Everything we had done was to have one baby," he said. "Anybody who says God doesn't have a sense of humor - everything we did was just for having one baby, and now we have three." To help tell them apart, the boys have a dot of maroon nail polish on their fingers. Logan Thomas, who weighed 4 pounds, 12 ounces, has a mark on his thumb; Eli Kirkwood, a 4-pounder, has polish on his forefinger, and Collin McGuire, at 4 pounds, 11 ounces, has a mark on his middle finger. Logan may have a problem with a non-functioning kidney, but the other children are healthy, doctors said. Allison, an education specialist for the U.S. Fish and Wildlife Service, said she has not decided whether to return to work. "That's one of those 'one-day-at-time' issues," she said. Sunday is a day of rest....so enjoy this little video all you Dads, Intended Dads and Moms who think that the Dads should help! Infant Swimming Resource has instructors throughout the United States. To find instructors outside of Phoenix, AZ log on to the national website - www.infantswim.com. I wanted to share this link with you today, especially for parents with swimming pools. After all, our goal is to keep all of our children safe!